Brazing, a popular induction heating application, is the process of joining two or more pieces of metal or ceramic material with a molten filler metal such as silver, aluminum alloy or copper. Brazing requires a higher temperature than soldering but produces a very strong bond which withstands shock, vibration and temperature change. Brazed joints are both liquid- and gas-tight and provide good electrical conductivity. 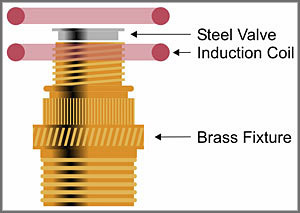 An induction brazing machine quickly delivers highly localized heat to minimize part warpage and distortion. Brazing in a controlled vacuum or in an inert protective atmosphere can significantly improve overall part quality and eliminate costly part cleaning procedures. Please download our 10-page Brazing Guide PDF for in-depth information about brazing processes, materials, filler metals and equipment. Brazing with induction heating is quick and clean.